New study says odds of missing a connecting flight out of SFO 2nd worst in nation. Even with the best of weather, San Francisco International Airport has more than its fair share of delays and cancellations, especially during the holiday season. In fact, it has one of the highest rates of delays in the entire county for arriving flights November through December. 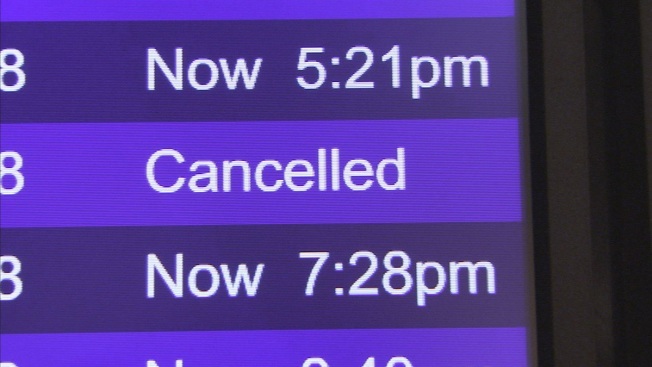 The NBC Bay Area Investigative Unit looked at three years of data from the Department of Transportation and found that out of an average of more than 52,000 flights arriving at SFO during the holiday months, 11 percent were delayed more than 45 minutes and 2 percent were cancelled. That’s nearly double the number of long delays and cancellations at Mineta San Jose International Airport and Oakland International Airport. “If you have a choice on what airport to fly through, you probably want to choose the airport where you’re most likely to actually get there, and to get there in a timely manner,” said AJ Smith, the Managing Editor of SmartAsset, a financial company that also analyzed flight data. SmartAsset calculated the odds of missing a connecting flight at 52 of the nation’s biggest airports and found that SFO ranked second worst, right behind Newark International Airport. “What that study is really picking up is that certain airports,--and San Francisco and Newark are certainly two of them--are operationally challenged,” said Mark Hansen, a professor of civil engineering at UC Berkeley. Hansen said the over-booking of flights contributes to the problem: “If they are thinking of cutting back, they worry that some other airline will just take that capacity and schedule more flights so it’s a hard thing for individual airlines to make good decisions,” Hansen said. Missing a connecting flight can increase travel costs significantly. SmartAsset estimates that getting stranded at SFO has cost travelers more than $65 million dollars over the past years. “Whether you’re booking a hotel room, whether you have to rent a car, or whether you are just wasting time sitting there and waiting, all that is costing money,” Smith said. There are ways to help avoid travel headaches and extra costs. Hansen recommends doing your homework when booking flights: “Virtually any travel booking site is going to very easily enable you to find out what the on-time performance of your particular inbound flight is and also of the outbound flight,” Hansen said. It may cost you some time before you fly out of town, but it could up to real savings by the time you head to the airport. NBC Bay Area requested an interview with SFO, but the airport declined our multiple requests for an on-camera interview.